In my last "Ask the iTunes Guy" column of the year, I discuss turning on Grid View in playlists, making playlists from folders of songs, adding tags to your tracks, and identifying the duration of selected tracks in iTunes 11. Q: I use playlists to sort classical music—and when I click a playlist, I like to see its albums in Grid View. I could manually click through dozens of playlists and turn on that view for each one, but is there a way to turn this view on, all at once, for all of my playlists? Unfortunately, no. iTunes assumes that you want playlists to appear in List view, which displays individual tracks. In addition, your playlists are at the left of the window, and the View button is at the right, so if your screen is big, you’ll have to do a lot of mousing to change it. I recommend that you make the iTunes window as small as possible while still showing playlists and the View button, and then go through all of your playlists and change views. 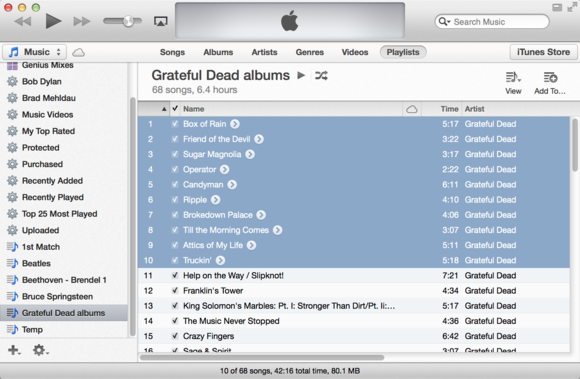 For more information on the changes to iTunes’ views, see "Understanding the new views in iTunes 11." Q: I store a lot of music in folders. Each folder contains an album or live sets. I’d like to import these folders to iTunes as playlists, where each folder becomes a playlist with the folder name containing the music stored in that folder. Is there any way to do this? If you have the sidebar visible (View > Show Sidebar), you can drag individual folders to the right of the word Playlists in the sidebar. iTunes will then create a playlist with the name of the folder and copy the contents of the folder over. 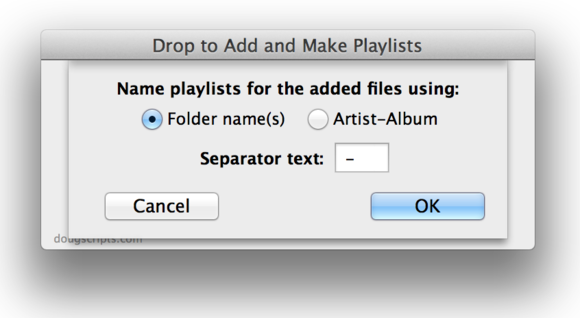 A more robust option is Doug Adams’s Drop to Add and Make Playlists AppleScript. Drag a folder containing an album or live show onto the applet, or double-click it and choose a folder. (Alternatively, you can drop multiple folders, or a folder containing other folders, onto the applet.) At that point, you can choose to name the playlist after the folder name, or to identify it in Artist-Album format. The applet will then import the files into iTunes and create the playlist with the name format you've chosen. 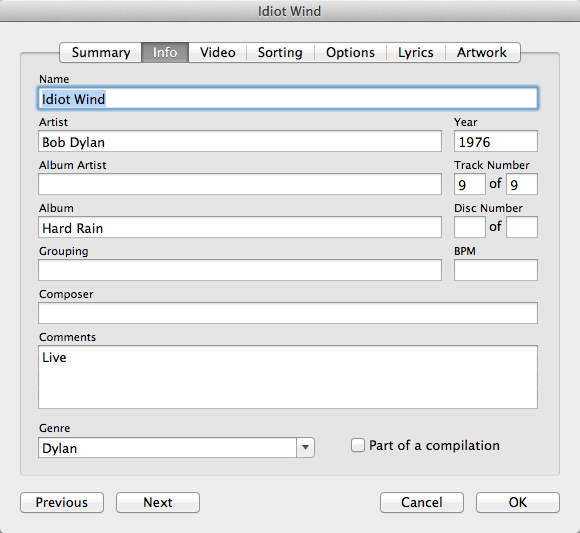 Use this AppleScript to turn your folders of music files into iTunes playlists. Q: Is it possible to place one’s own tags or flags on songs? I would like to mark tracks that I have used for certain purposes, but I can’t find a way to do so. You can do this in a couple of ways. If you don’t rate many of your songs, you can use ratings to flag them. For example, when I listen to music, I rate as one-star any tracks I encounter that have problems in them, such as ripping glitches. Another possibility is to add comments to your tracks. Select a track and press Command-I, and a Comments field will appear in the Info window. You can put any text you want here; for example, you might add a keyword or tag that will serve to mark specific tracks. In the Info window for a track, you can add comments. Here, I've added the word 'Live' as a Comment to the track, indicating that the song is from a live album. I have also created a smart playlist to find all of my live Bob Dylan tracks, searching for the artist and for this keyword in the Comments field. After adding comments, you can search for tracks based on the text in the Comments field in a smart playlist. Choose File > New > Smart Playlist; select Comments Contains in the Smart Playlist window; and in the empty box to the right of your rule selections, enter the text that you want to search for. You can also sort by comments, if you’re in Songs view. Press Command-J to display the View Options window, and check Comments in the Personal section. A Comments column will appear. Click the column header to sort by comments alphabetically. The smart playlist method is probably easier, since you can create a playlist for each specific tag you use. Q: Before version 11 of iTunes I could always highlight subsets of my playlist to see how much time all of the songs would take to play. With version 11, I can’t figure out how to display subsets of time. The total time of the playlist is visible at the top but that's not adequate. Is there any way to get this information? Yes—but by default, iTunes 11 has hidden it. In iTunes go to View > Show Status Bar. Select some tracks in your playlist, and look in the status bar to see their total time. Q: I regularly purchase music content from iTunes and then convert the AAC files to Apple Lossless. I think I am hearing a sound quality improvement on my home stereo system, but after doing a bit of research, I am wondering now if the only thing I am accomplishing by upsampling a purchased AAC audio file to Apple Lossless is using up more hard drive space? Long answer: Lossless files are great for letting you retain full sound quality in a smaller file size than uncompressed audio would occupy. But you can’t get back any of the information discarded when encoding lossy audio files (such as AAC or MP3); consequently, as you suspected, converting them to Apple Lossless will balloon their file size without improving their sound quality.